Her very ribs showed. 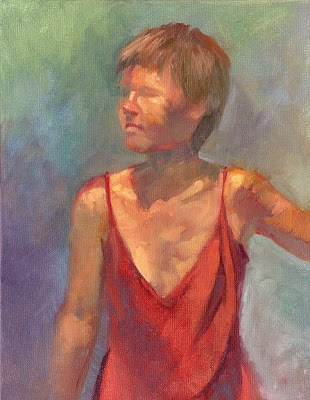 After pretty much bombing at my first workshop with impressionist Don Hatfield last week, I was fairly happy with the results of my 3-hr figure study today. He demonstrated, and I finally understood what he meant by "painting through the form." It means if you are painting the background color, let it continue on into the figure; then cut the figure color back into the background--or vice versa. This softens the edges and creates lovely color blends that unify the painting. nice piece. I can see how the background works with the image. I like so many of your paintings that you have done and the style in which you have done them...I REALLY like what you're doing here... the loosening up. I look forward to seeing how this melds with everything you already bring to your artwork. Thanks so much, Gai and Pat. For me, major breakthroughs in painting have been almost non-existent; but this --along with Frank Ordaz's empahsis on temperature--may be the rare exception. The challenge will be figuring out how to integrate some of Don's impressionistic approach into other subject matter from other sources. It is VERY different from how I typically work; but I really like it and am excited to try. I think it is partially a matter of the teacher(s) appearing when the student was ready.